During the 2016 summer holidays a large refurbishment was carried out at Focus School Stoke By Nayland Campus. Zentura carried out the refurbishment within budget and in a very tight timeframe of only 6 weeks! A dramatic transformation took place in the school which included reconfiguration of the classroom layouts to embrace Self Directed Learning (SDL), new furniture throughout the school, a new staff hub area and much more. As part of the new SDL programe, the classrooms have been split into collaborative zones, semi-collaborative zones and focused zones which have enabled the students to choose their learning enviornment depending on how they learn best. The staff at Focus School have been treated to a first class area which features a kitchen and break out zone, a collaborative zone for team discussion, seating booths for lesson preparation and even a shower! Beacon Lights were awarded the challenge to draw up a lighting design that would create a stylish café feel within the staff area. 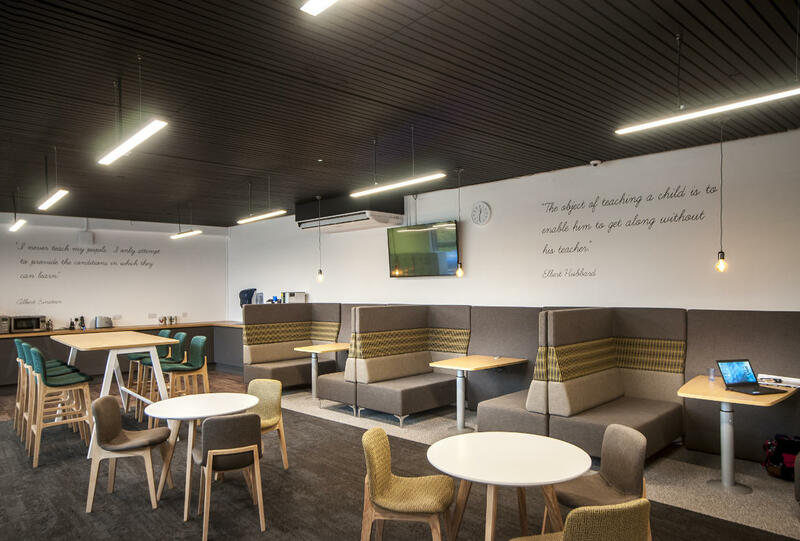 As seen in the images, the light fittings chosen are slim and modern and have created the desired effect, whilst ensuring the light levels are supportive of the important work of the Focus School staff.